57 participantes, 11 sin falta, 6 sin ninguna penalidad en el desempate, 7.500€ el ganador, diseño del suizo Gerard Lachat. 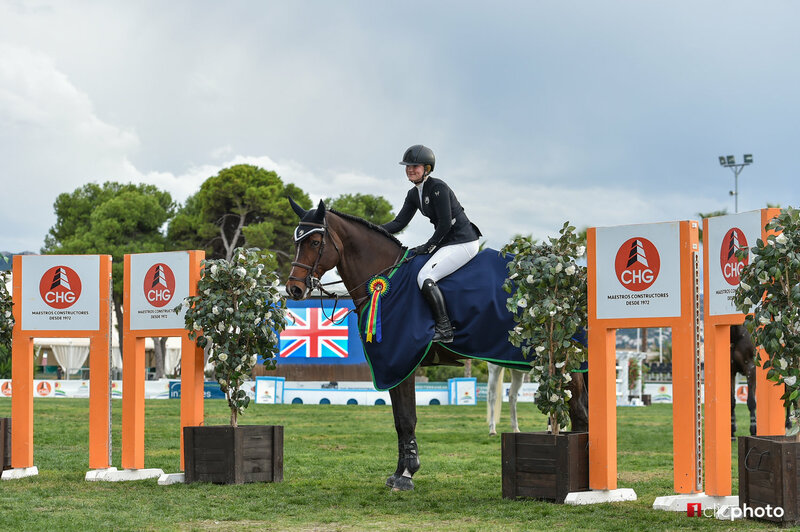 It was double British on top in Sunday’s CSI2* Grand Prix presented by CHG at the Autumn MET 2018, with the young and talented Emily Moffitt taking the victory ahead of Matthew Sampson. 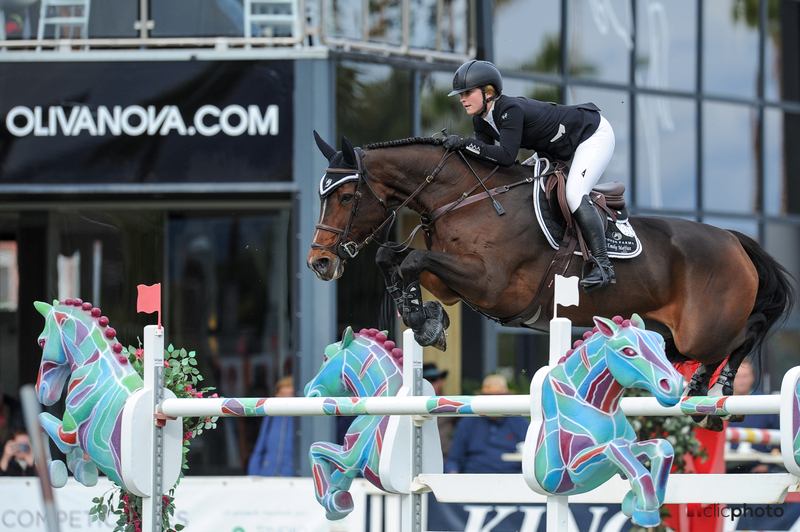 Earlier this week, the Mediterranean Equestrian Tour’s 2018 autumn edition returned for its last part and Sunday’s 1.45m Grand Prix counting for the world ranking concluded the first of three weeks of competition. A total of 57 horse-and-rider combination had lined up to compete in the Oliva Nova grass ring over Gérard Lachat’s track, and eleven of them managed to produce clear rounds to move on to the jump-off. As second to go in the jump-off, Matthew Sampson – always a danger against the clock – put the 9-year-old mare Ebolensky (Clinton x Heartbreaker) into top gear, with a lightning fast round in 36.82 seconds. The time to beat was set, and it looked hard to match. Four riders later, Sampson was still the one to catch as Moffitt entered the ring on her 11-year-old mare Tipsy du Terral (Toulon x Quat’Sous). Fearless, Moffitt set off at a high pace already from the start and did not once pull back to shave the time down to 36.15 seconds – pushing her compatriot Sampson down to the runner-up spot. Ireland’s Niall Talbot finished third with Caracter (Carano x Liatos) with a clear round in 37.21 seconds.“I actually have Tipsy here as a preparation for the Longines Global Champions Tour in Doha in November, where she will be going next,” Moffitt explained. “She is my best horse at the moment. It took us a few shows to click, but when we did we started winning. Tipsy is such a naturally fast horse, with a big stride. I can leave out strides on her, but still turn really fast which makes her a real winner and hard to beat,” Moffitt said about her winning partner. "Matthew Sampson had a really fast round. I sometimes get a bit stressed and kept on asking my trainer Ben Maher ‘What’s the plan’, ‘What’s the plan’. Ben told me to leave out a stride to the second and the third jump, and I stuck to that. For the rest I went as fast as I could, and it all worked out!” the happy winner said. Moffitt and her Poden Farms-team has had great success during the Autumn MET 2018, with her trainer Ben Maher winning the opening Grand Prix earlier this month. “We seem to be on a bit of a roll,” Moffitt smiled. “We’ll try our best next weekend too, but then we’ll be using different horses.”It’s not the first time in Oliva for the young, British rider. “I was also in Oliva last year for the Autumn MET and won one of the Grand Prix classes back then as well. I love it here; the grass ring is great! I normally always compete at the Global Champions Tour circuit, so what is good about being here is that I can bring out a different set of horses – new ones, or the ones that are coming back or that maybe need more experience,” Moffitt closed off about the benefits of competing at the Mediterranean Equestrian Tour. Photo credit: Photos © Hervé Bonnaud / www.1clicphoto.com. These photo may be used only in relation to this press release and must include photo credit.